Fruits and vegetables are an important part of a healthy diet. Your local markets carry an amazing variety of fresh fruits and vegetables that are both nutritious and delicious. As you enjoy fresh produce and fresh-squeezed fruit and vegetable juices, it's important to handle these products safely in order to reduce the risks of foodborne illness. Harmful bacteria that may be in the soil or water where produce grows may come in contact with the fruits and vegetables and contaminate them. Or, fresh produce may become contaminated after it is harvested, such as during preparation or storage. Eating contaminated produce (or fruit and vegetable juices made from contaminated produce) can lead to foodborne illness, which can cause serious - and sometimes fatal - infections. However, it's easy to help protect yourself and your family from illness by following these safe handling tips! 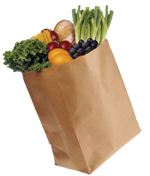 You can help keep produce safe by making wise buying decisions at the grocery store. 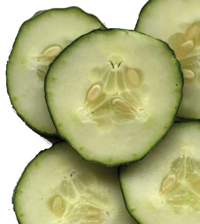 All produce that is purchased pre-cut or peeled should be refrigerated to maintain both quality and safety. All produce should be thoroughly washed before eating. This includes produce grown conventionally or organically at home, or produce that is purchased from a grocery store or farmer's market. 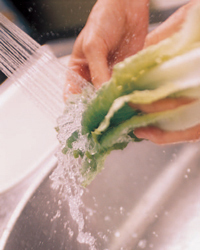 Wash fruits and vegetables under running water just before eating, cutting or cooking. Many precut, bagged produce items like lettuce are pre-washed. If so, it will be stated on the packaging. This pre-washed, bagged produce can be used without further washing. Raw sprouts that are served on salads, wraps, and sandwiches may contain bacteria that can cause foodborne illness. Rinsing sprouts first will not remove bacteria. Home-grown sprouts also present a health risk if they are eaten raw or lightly cooked. To reduce the risk of illness, do not eat raw sprouts such as bean, alfalfa, clover, or radish sprouts. All sprouts should be cooked thoroughly before eating to reduce the risk of illness. This advice is particularly important for children, the elderly, and persons with weakened immune systems, all of whom are at risk of developing serious illness due to foodborne disease. Keep fruits and vegetables that will be eaten raw separate from other foods such as raw meat, poultry or seafood - and from kitchen utensils used for those products. Most of the juices sold in the United States are processed (for example, "pasteurized") to kill harmful bacteria. But when fruits and vegetables are fresh-squeezed and left untreated, harmful bacteria from the inside or the outside of the produce can become a part of the finished product. Some grocery stores, health food stores, cider mills, and farm markets sell packages and containers of juice that was made on site and has not been pasteurized or otherwise treated to kill harmful bacteria. Juices that are fresh squeezed and sold by the glass - such as at farm markets, at roadside stands, or in some restaurants or juice bars - may not be pasteurized or otherwise treated to ensure safety. Warning labels are not required for these products. If you or someone in your family is at risk for foodborne illness, and you cannot determine if a juice has been processed to destroy harmful bacteria, either don't drink it or bring it to a boil to kill any harmful bacteria that may be present. Those at risk for foodborne illness should not drink unpasteurized juice unless it is brought to a boil first. Organic produce is grown without using most conventional pesticides; fertilizers made with synthetic ingredients or sewage sludge; bioengineering; or ionizing radiation. Before a product can be labeled "organic," a government-approved certifier inspects the farm where the food is grown to make sure the farmer meets the U.S. Department of Agriculture's organic standards. Companies that handle or process organic food before it reaches the supermarket or restaurant must be certified, too. What is ethylene gas - and how does it affect produce? Some fruits and vegetables - like bananas - naturally produce ethylene gas when they ripen. Oftentimes, such fruits and vegetables are harvested in the unripened state to preserve firmness and for long shelf life; they are later exposed to ethylene gas to induce ripening. What does the "use-by" date mean on a package of fresh produce? A "Best-If-Used-By- (or Before)" date is the last date recommended for peak quality as determined by the manufacturer of the product. Why are wax coatings used on fruits and vegetables? Many vegetables and fruits make their own natural waxy coating. After harvest, fresh produce may be washed to clean off dirt and soil - but such washing also removes the natural wax. Therefore, waxes are applied to some produce to replace the natural waxes that are lost. Waxes also help inhibit mold growth, protect produce from bruising, prevent other physical damage and disease, and enhance appearance. How are the waxes applied? Waxes are used only in tiny amounts to provide a microscopic coating surrounding the entire product. Each piece of waxed produce has only a drop or two of wax. Coatings used on fruits and vegetables must meet FDA food additive regulations for safety. Produce shippers and supermarkets in the United States are required by federal law to label fresh fruits and vegetables that have been waxed so you will know whether the produce you buy is coated. Watch for signs that say: "Coated with food-grade vegetable-, petroleum-, beeswax-, or shellac- based wax or resin, to maintain freshness."